I am delighted to announce the release of BimorphNodes v2.2, which is now available for download via the Dynamo Package Manager. BimorphNodes v2.2 introduces the new LinkElement class nodes to Dynamo which are purpose-built for retrieving elements from linked Revit models. While this functionality has existed for some time in a number of other packages, what makes LinkElements unique are the range of additional properties and features they implement that solve a major limitation in the Revit API (and therefore Dynamo) concerning the location of linked elements within their host file. The other significant update in v2.2, also related to this issue, is the addition of holistic support for linked element clash detection using any of the Bimorph Element and BoundingBox nodes. LinkElements serve a vital role in enabling this functionality, resulting in a range of nodes that are no longer impeded by the problems that arise from limitations in the Revit API. The new LinkElement nodes include a range of methods and properties for retrieving and interacting with Elements from a linked Revit model (a Link Instance). What makes LinkElements unique are the way they locate the linked element in the host file. This is significant as the Revit API has a limitation which restricts linked elements to their external files origin-to-origin location, regardless of any transformations made to them in the host file. LinkElements have been purpose-built to solve this limitation by performing operations, such as geometry extraction, at the linked elements host location. The linked element transform limitation manifests only in the Revit API context, which subsequently exposes a number of BimorphNodes to the problem. As mentioned, this limitation causes linked elements to default to their external files origin-to-origin position, regardless of any transformations made to their Link Instance in the host document. The Revit projects most at risk are those where transformations have been applied to the Link Instance for coordination purposes, which is likely if Shared Coordinates are in use or if linked models have been manually moved to align with the main building model. The problem is most pronounced when calling Revit API methods on a linked element where its relative location in the host file is required to yield a result. For example, the Revit API ElementQuickFilter and ElementSlowFilter class methods – which are used for clash detection in the BimorphNodes BoundingBox and Element nodes – produce erroneous results if element A vs B includes any linked elements which have been transformed. This is especially confusing to users since any linked Revit models which are moved to visually align with other links or live elements in the host file, are positioned back at their respective origin-to-origin locations in the API context (which the users cant see), causing the clash results to fail unexpectedly. Settling for compromised functionality that would have prohibited unlimited support of Link Instances (in fact, it would have limited each link to just 1 per document) with crippled performance, was unacceptable, and this led to the development of the LinkElement class and the decision to make it exclusive. 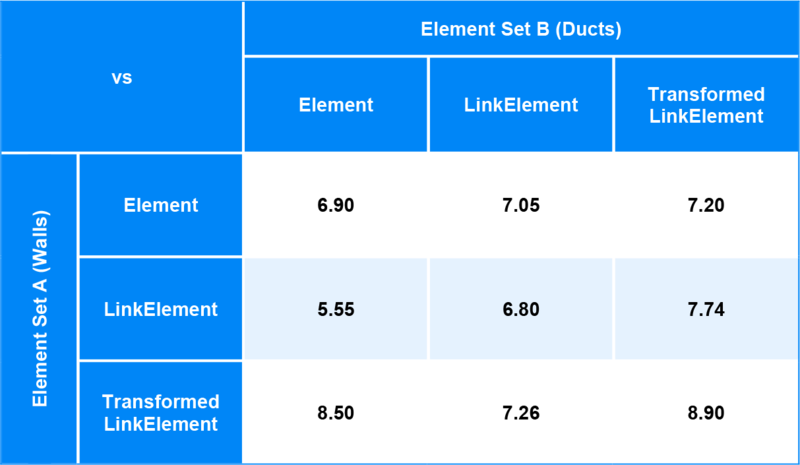 The LinkElement class therefore plays a vital role in enabling the new linked element support in the Bimorph Element and BoundingBox nodes. To maximise functionality, LinkElements inherit from Dynamo’s Revit.Elements.Element class, meaning instances are compatible with all of Dynamo’s Element nodes and any other nodes that accept Elements as inputs. 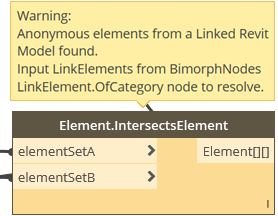 There are some limitations with certain nodes in Dynamo’s Revit library that will not recognize LinkElements. For example, LinkElement Room’s are not compatible with the OOTB Room nodes, such as Room.Number, due to the inheritance hierarchy. To resolve such issues, use the LinkElement.Element node to extract the wrapped Revit element (i.e. the Dynamo Revit Element). The Element.IntersectsElement, Element.IntersectsSolid, BoundingBox.GetElementsInside and BoundingBox.GetElementsIntersecthave been updated with a new clash detective algorithm which enables holistic support for linked elements even if their Link Instances have been transformed or translated. It means that the limitation imposed on linked elements by the Revit API, which before the update impeded their functionality, is now fully resolved. To provide this support the nodes depend on the new LinkElement class and leverage its properties to locate linked elements at their host locations. By utilising LinkElements, the nodes can be used to develop unique and highly versatile workflows that range from supporting linked elements from an unlimited number of Link Instances (ideal for large-scale schemes and master plans where multiple Link Instances are common), to linked element vs linked element clash detection, even if the elements derive from multiple Link Instances with different origin-to-origin locations (a problem which has no direct solution in the Revit API). The nodes also implement a smart logic-tree which is designed to execute only the subroutines that are relevant to the conditions of the intersection test being computed. The logic tree is central to minimising any performance overheads that arise from the new infrastructure, resulting in near-negligible compromises to speed-of-execution. In terms of performance, clash detection using BimorphNodes is between 2-3x faster than the IC tool, however its not possible to conduct any meaningful performance analysis as the IC functions differently and requires additional time to render the UI clash report dialog. Providing the Element and BoundingBox nodes with holistic support for linked elements has not resulted in any changes to their inputs or outputs as all the updates have occurred internally. Therefore, using LinkElements with these nodes is no different to using Elements; simply collect the required linked elements using the LinkElement.OfCategory node, then provide the resultant LinkElement instances as inputs. To enable holistic support for linked elements the Element and BoundingBox codebase has grown significantly. The new infrastructure includes subroutines that execute based on the conditions of the elements input (ordinary Element, non-LinkElement, LinkElement or tranformed LinkElement) and include all the logic to resolve the linked element transform limitation. The result? Between a 15-90% performance increase compared to BimorphNodes v2.1. Computation times shown in seconds. Walls (2,300) vs Ducts (2,160). Total Possible Clash Tests: 4,968,000. To support the transition to LinkElements, BimorphNodes BoundingBox and Element nodes include new exception handling to validate the list of elements input by the user. While this provides useful feedback if an invalid linked element is found, it reintroduces the performance impacts that led to the development of the LinkElement class in the first place (as the validation procedure must access each elements Document property to check if it is linked). To mitigate these impacts but still provide the advantages of element validation, a method of ‘validation sampling’ has been implemented. Note that as a selection of elements are evaluated, there is potential non-valid linked elements can pass through the validation test if they are between the selection interval. However, the risks are negligible as the user would need to input a heterogeneous list interspersed with only a few invalid linked elements for this to occur. To eliminate the risk completely, always use LinkElements when your workflow requires them. There is known bug in Dynamo which throws a ‘dereferencing a non-pointer’ exception whenever a list of objects which contains either null or an empty list at index 0 (the start of the list) is input into any Query (property) node. While most workflows are unlikely to be affected, it requires special mention since the Element.Intersects nodes are designed to output clash results via a 2D list (list of lists), where empty sub-lists indicate no clashes. Due to this behavior, there is a higher probability that index 0 will be empty, making these nodes more susceptible to the bug. As the Dynamo dev team have stated the bug is unlikely to be fixed by Dynamo v2.0, a simple workaround can be used in the interim by cleaning the list of empty sub-lists before passing it into any Query nodes using the OOTB List.IsEmpty (set to @L2 lacing) and List.FilterByBoolMask. There have also been a range of updates made to the nodes listed below. To learn more about what has changed and see the full range of nodes in v2.2, visit the main article covering the release of BimorphNodes V2.2 here. We’ve also recently moved the BimorphNodes dictionary to our new domain, bimorph.com. Links for the old .co.uk domain automatically redirect, but we recommend updating any bookmarks and referring links to point to the new domain. Last edited by Thomas__Mahon; March 26th, 2018 at 12:59 AM. cellophane and PolynineStudio like this. Which is better for Clash Detection in mep - BIM or Revit? What Are You Using For Clash Detection?